The NFL Films world feed of Super Bowl LIII once again plays a major role, ultimately being distributed to more than 180 countries and territories and in 25 languages. And, in a sign of the game’s growing popularity outside the US, broadcasters from 25 countries are onsite, the most ever. Twelve of them have studios; the rest are commentary only. 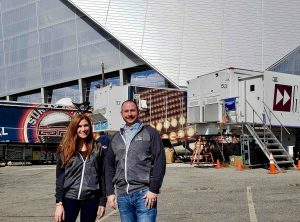 “They will do anything from a full show with their own cameras and trucks to just radio with commentary back to their host facility,” said Jeff Lombardi, senior director, international production, NFL. Broadcasting the game with onsite crews are Australia, Brazil, Canada, China, Denmark, Germany, Hungary, Japan, Mexico, Sweden, and the UK, and Lombardi says there was interest from others to do more as well. Lombardi notes that interest from foreign rightsholders depends on everything from where the game is being played to the global economy. But also helping is what the NFL production team is doing with respect to things like fibre deployments that can get more signals to more locations. “That brings our costs down so we can offer a better rate to the broadcast partners,” he said. The vast majority of international viewers are treated to a world feed built around the CBS clean feed. The NFL team has four cameras and isos for cutaways during commercial breaks or sponsored CBS elements. Joe Zucco directs and Brian Hennessey serves as producer — roles the two have embraced over the past few years. NHK is onsite producing the game from its NHK-K4 production unit, which has an Evertz router, a Sony MVS-8000X production switcher and a Lawo audio console. Televisa is another broadcaster that has stepped up its game. It is onsite with its own Televisa production unit as well as an uplink. “Televisa is going to incorporate their own Phantom slo-mo camera [located] in the low-end-zone position into their broadcasts,” said Lombardi. The biggest change on the international front is ESPN International, which is onsite, working in NEP EN2 A and B units and Game Creek Video’s Spirit A and B units. BBC, housed in the Gracie truck from Harb Production Services, carries the CBS broadcast rather than the world feed. Broadcasters onsite are producing coverage in a total of 10 languages: Mandarin Chinese, Canadian French, Danish, English, German, Hungarian, Japanese, Portuguese, Spanish, and Swedish. And the Super Bowl LIII Cybercast — which is streamed on SuperBowl.com, SiriusXM Radio, and TuneIn — offers listeners nine languages: Mandarin Chinese, Canadian French, Danish, German, Hungarian, Japanese, Portuguese, Spanish, and Swedish.